No one in all of Greek mythology has more face-time with freakshow creatures, mutated monsters and villains of all different temperaments than does the ultimate superhero of ancient times, Hercules. One after the other, on his legendary journeys of lethal danger into the unknown, he lines up the most bizarre breathing beings that anyone could possibly throw against him and he slices, dices and basically destroys anything deadly that dares to look at him funny. Even without his near-impossible Twelve Labors, the guy had put together an impressive kill-list of foes vanquished. One such enemy was encountered far beyond the boundaries of the known Greek world, into the wild seas beyond the Pillars of Hercules (now known as the Strait of Gibraltar, which separates the Mediterranean Sea from the Atlantic Ocean), a giant with features so random, you'd swear that someone had truly made him up. In his Tenth Labor, his cousin, the irritating chump-wimp King Eurystheus demanded that Hercules go forth and collect the mystical cattle belonging to an even more mystical giant named GERYON, who lived beyond the Sunset Lands to the West, Eurystheus was fairly sure that this task would kill off his hated cousin once and for all, as he wasn't even half certain that Geryon even existed! No one knew his true form; he existed in legend and that was about it. For all Hercules knew, he could be hunting down something that didn't even exist in the first place! Yet the hero had no choice whatsoever; he had to go out and see if he could find the above-mentioned cattle in order to ultimately cleanse his soul for killing his family in a madness brought on by the Queen of Gods, Hera. To get to the lands where Geryon lived his mysterious existence, Hercules needed to travel beyond the known world and so sailed west to the end of the Mediterranean Sea. According to legends at the time, the Strait of Gibraltar didn't exist; Africa and Europe were solidly connected. This was nothing that Hercules was going to let stand in the way of progress, so he took his sword and slammed it, blade first, into the solid rock of the land. Cracks instantly began to form, growing wider and wider, as the seas began to pour in through the opening he was creating a passageway between the Mediterranean and Atlantic big enough to sail through! From that point on, the passageway was known as the Pillars of Hercules, an honor that it still carries in many circles. Sailing on out into the great, dark and deadly unknown of the Atlantic Ocean, far beyond anything any Greek had ever seen, Hercules searched the raging, monster-laden seas for the island where Geryon was said to be located. Weeks turned into months and even the great Hercules began to wither, weak from so much time at sea without the strength of land beneath him. Fate was kind however, and eventually, Hercules made land-fall on the remote and lonely island of Erytheia, where Geryon and his much-prized red cattle were supposed to be found. Upon landing and pulling his well-traveled boat up onto the beach, he was immediately attacked by a huge, black two-headed dog, a watchdog of such intensity that even the battle-hardened hero was barely ready for it. More than that, the guard-dog had two heads, being a brother of Cerberus, the guardian of the Underworld. This was Orthrus, Geryon's personal junkyard dog, another son of Echidna, the "Mother of All Monsters" and Typon, the giant storm-beast that tried to wipe out the Olympians. Already, you get that this dog was no toy poodle or yapping, precious football-sized darling. Hercules was having none of it however, and drew his giant war club , forcefully slamming it into the skull of the red-eyed, near-rabid portrait of dark canine atrocity. One skull was crushed and the other one soon died, bringing an end to Geryon's guard dog. Next in line to jump to the defense of the island was Geryon's personal... shepherd? Cow-hand? Whatever you'd call a mortal that watches after divine red cattle...a serious fellow (in fact, a Centaur! Half man, half horse!) by the name of Eurytion, who made the fatal mistake of trying a frontal attack on the mighty Herc. Most of Eurytion's face soon became red hamburger meat as Hercules pulverized it, too. Two casualties in five minutes; pretty standard for the legendary hero! Upon hearing the ruckus from his napping spot, that is when the elusive, mysterious and as-of-yet-unseen Geryon finally arose, stretched his immense body as he stood, joints cracking and popping, and finally showed up on the scene to see what all of the commotion was. At long last, Hercules would be face to face with a figure that no one back in Greece even really thought existed! Coming out from behind a giant rock outcropping came the massive Geryon, revealed at last. The son of Chrysaor (and grandson of Medusa! ), Geryon stood several stories tall and was oddly not just ONE body! He had three heads, three bodies and three sets of legs, all conjoined together into one monstrous mixture of ropy muscle, rough gristle, dark matted hair, intense body odor and a lifetime supply of pure ugly. His heads were human (although of a very nasty and unpleasant sort of human), and he was dressed in a weird assortment of Greek-style armor that fit over his freakish, twisted and shared body. In three massive, calloused, clawed, gross long-fingernailed hand, he clutched three lengthy and wicked looking spears, and in the other three hands, he wielded three massive bronze decorated shields. He was the very image of a warrior...well, if the warrior had three sets of arms, heads and legs, and hadn't seen soap and water in a very, very long time! Looking down at Hercules, and then over to his much-loved two-headed pet, smashed to a pulp on the ground, and then over to his trusted herdsman (likewise beat to red paste by Herc's olive-wood club), then back to Hercules, the giant nightmare on six legs raised his arms and head to the skies and let out a fearsome bellow, causing even Hercules to cover his ears to save them from having his ear-drums blown out by the sonic rage charging and rebounding through the sky. Geryon hoisted all three spears, gnashed his many teeth, grunted out some unspeakably foul language aimed at the sacredness of Hercules' mother and galloped forth like a mountain on the move, scattering the mooing red cattle into a stampede around his nasty, toe-jammed and fungus-coated feet. Hercules missed the first few spear-jabs that came his way and knew that Geryon would be far too big to wrestle, take down with his club or fight fist-to-fist; this was going to take a little something extra. Remembering his past exploits, the hero got an idea, one that had saved his thick-hided bacon in several of his former Labors. Avoiding being stomped flat by the increasingly frustrated (and dangerous) Geryon or shish-kabab'd by his three sharpened spears, Hercules quickly strung up his bow and reached for his arrows. 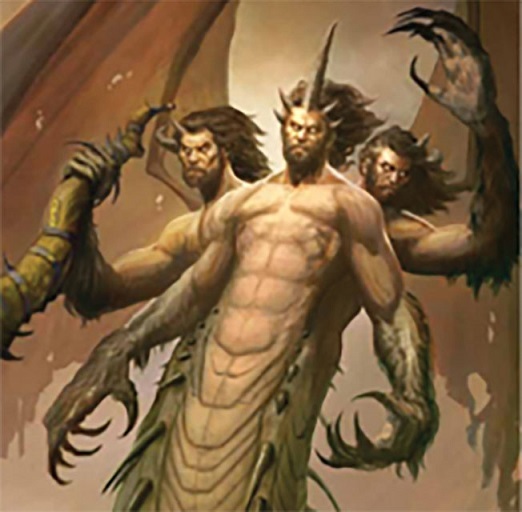 Not just any arrows; these were from his "dipped in the blood of the toxic, deadly Hydra" collection, guaranteed to bring down even the largest beast, giant or in this case, THREE giants. Or so he hoped. Hercules drew his bow back and let the first arrow fly, but it careened and bounced harmlessly off of one of Geryon's shields. A miss, however the second arrow flew true; almost as if guided by the gods, the tiny, toxic missile flew up and onward, planting itself directly into the giant, crusty left eye of Geryon's middle head. Immediately, the giant roared in exquisite pain, his large calloused hand going up to his now-blinded, blood-spurting eye (which began erupting all over the area in stream-like quantities! ), but even if he managed to get the arrow out and survive the ongoing fight, it wouldn't matter; the blood of the Hydra that had entered the giant's eye had already begun to work into his bloodstream. Within seconds, the poison began to destroy his innards, freezing his muscles and shutting the massive body down one organ at a time, his laboring, foul breath getting faster and faster and his heart beating slower and slower. Within no more than a minute, the towering freakshow that was Geryon toppled like a mighty oak being brought down by a lumberjack, his armor and weapons clattering like several freight trains colliding, all the way down to the unmoving, unyielding and unforgiving ground. Hercules had no time to savor the victory as the looming shadow of the vanquished giant began to close in on him as he swiftly came towards his final resting spot. Ancient Greece Reloaded the place in which all mythology lovers gather. A place in which libraries, articles and data from all around the world will be gathered so as for everyone to access it, for free (! ), and find any info, about Ancient Greek Mythology, that he or she is looking for.